The dates, times and venues have been announced for this week’s Gaelic Games action. 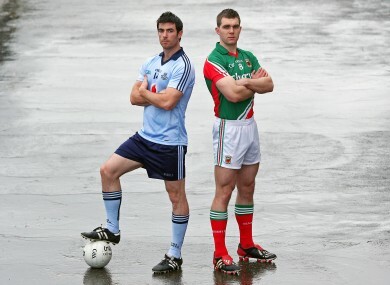 Dublin's Michael Darragh MacAuley and Mayo's Seamus O'Shea will be in opposition next Sunday. Here’s this week’s key GAA fixtures with the centerpiece of the action taking place in Croke Park next Sunday ask Dublin and Mayo bid for an All-Ireland final place against Donegal on September 23rd. All-Ireland intermediate hurling championship final: Tipperary v Kilkenny, Semple Stadium, Thurles, 6pm, (James Owens, Wexford). All-Ireland senior football championship semi-final: Dublin v Mayo, Croke Park, 3.30pm, (Joe McQuillan, Cavan). All-Ireland minor football championship semi-final: Dublin v Kerry, Croke Park, 1.30pm, (Fergal Kelly, Longford). And here are this week’s TG4 Ladies Football championship fixtures with Galway meeting Kerry in the first senior semi-final next Saturday afternoon. Senior championship semi-final: Galway v Kerry, St Brendan’s Park, Birr, 4pm, (E O’Hare). Intermediate championship semi-final: Armagh v Longford, St Brendan’s Park, Birr, 2.15pm, (PJ Rabbitte). Intermediate championship Group C playoff: Sligo v Waterford, St Brendan’s Park, Birr, 6pm, (J Murray). Junior championship semi-finals: Louth v Offaly, Clane GAA club, Kildare, 1.30pm, (M Henry); Antrim v Wexford, Clane GAA club, Kildare, 3.15pm, (S Duane). Email “GAA and Ladies Football championship fixtures ”. Feedback on “GAA and Ladies Football championship fixtures ”.